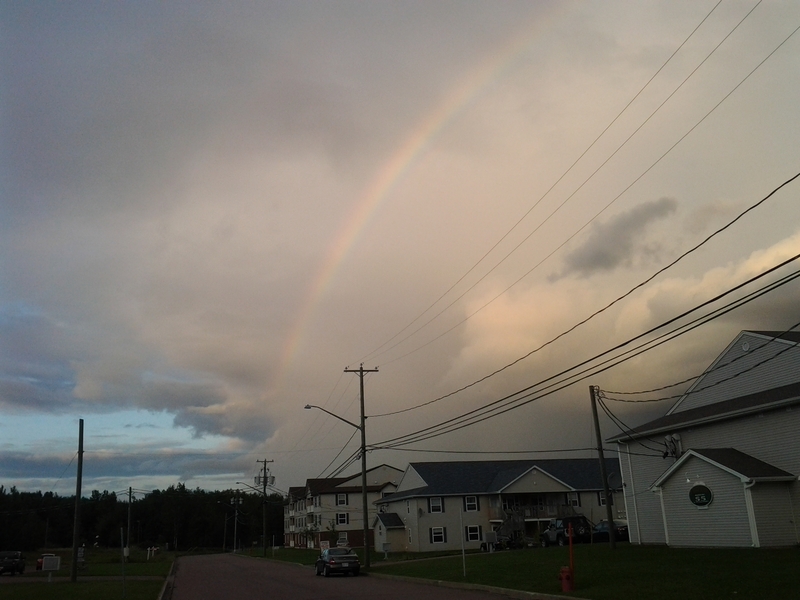 After a warm and sunny July in Southeast New Brunswick, August was a definite disappointment with cool and unsettled conditions for a large part of the month. Daytime highs were warm and above normal at the beginning and near the end of August but there was an extended period with cool, cloudy days and mild nights. Although it often seemed wet, there were only three noteworthy rain events and overall precipitation was just slightly above average. Despite single digit low temperatures across New Brunswick this morning, forecasters are suggesting there is still more summer to come in September. Yesterday in Greater Moncton, the daytime high was 17.2 C, making it the coolest day since late June. This morning’s low of 5.3 C was also the chilliest minimum temperature in a couple of months. 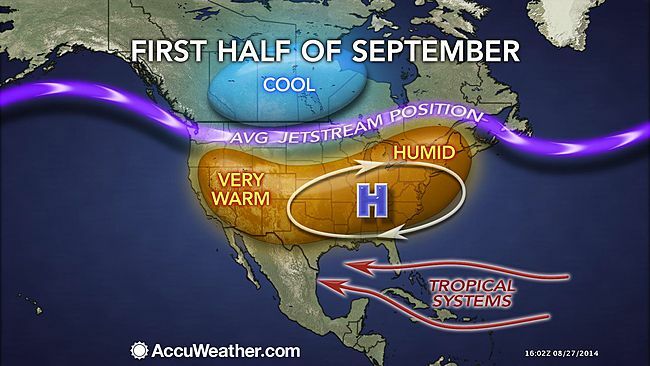 But Accuweather believes the weather pattern during the first half of September will feature many days with above average warmth. Hurricane Cristobal continues to churn in the Atlantic tonight, about 450 km east-southeast of Cape Hatteras and racing northeastward toward the Grand Banks. 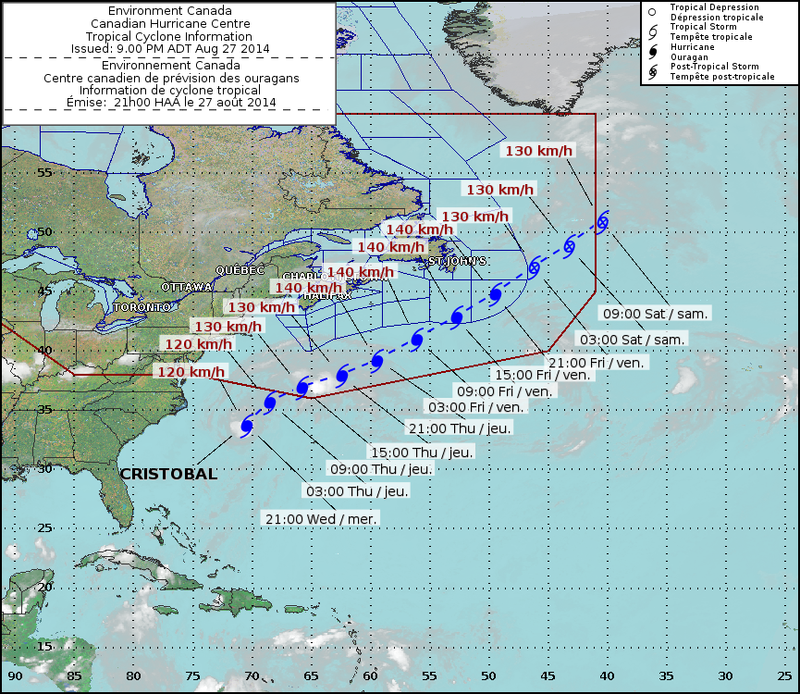 The Canadian Hurricane Centre says Cristobal will likely merge with a cold front moving southward over Atlantic Canada. Forecasters say the result will be periods of heavy rain, gusty winds and fall-like temperatures for the Maritimes and Newfoundland by Friday. Summer-like warmth has finally returned to Southeast New Brunswick after endless cool, mostly cloudy days. Edmundston was actually the hot spot in Canada today at 32.1 C with many other communities reaching 30 C.
Greater Moncton hit 29 C which is the warmest so far this August but that high could be beaten tomorrow. 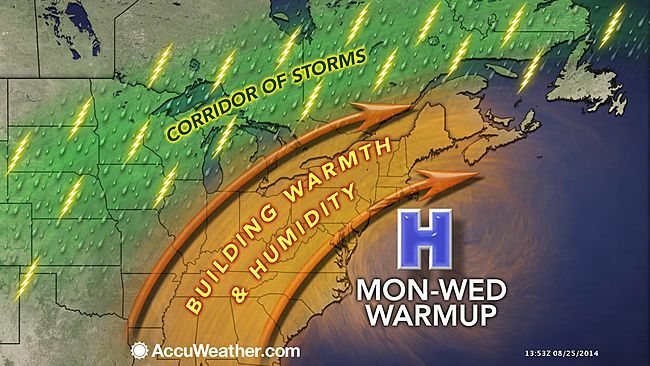 The warm spell will be short-lived with a cooler and less humid air mass moving into the region later this week. Over the past week in Southeast New Brunswick, the weather hasn’t been able to make up its mind. Dark, ominous clouds give way to showers which leads to brief clearing and a bit of sun before the cycle repeats. Daytime highs have also been running about five degrees below normal but overnight lows have remained relatively mild. Forecasters maintain more summer-like heat will return at the end of the month. More than 50 forest fires are currently listed as out of control in the Northwest Territories during what has become a summer of fires. 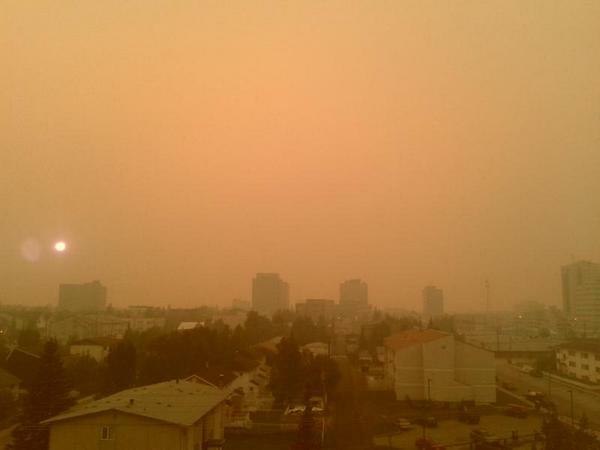 The blazes have scorched more than three million hectares of land and have created drifting smoke which has meant poor air quality in numerous communities including the capital of Yellowknife. 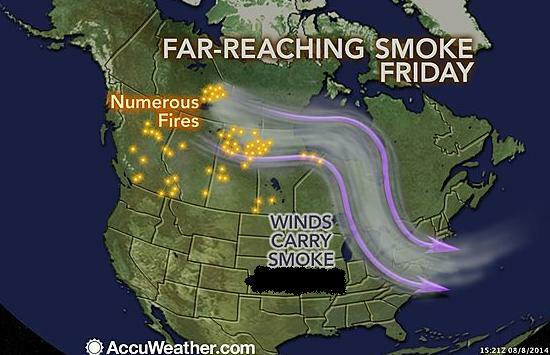 Smoke from the fires has also been carried southeastward by the jet stream to Ontario, Quebec and the Northeastern United States keeping daytime highs lower than normal. Commercial fishermen also say the fires have dramatically raised temperatures in rivers and streams leading to a scarcity of fish. 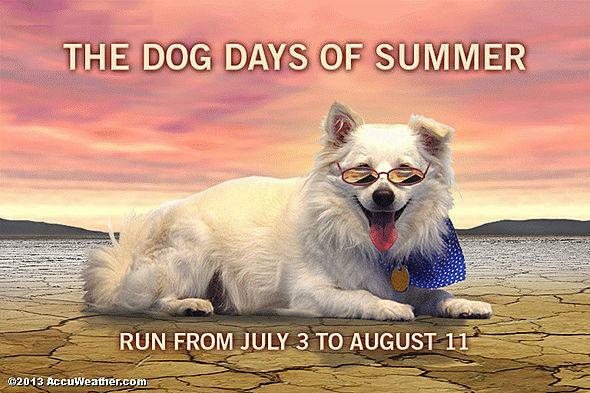 The 40-day period commonly known as the “Dog Days of Summer” officially comes to an end today for 2014. 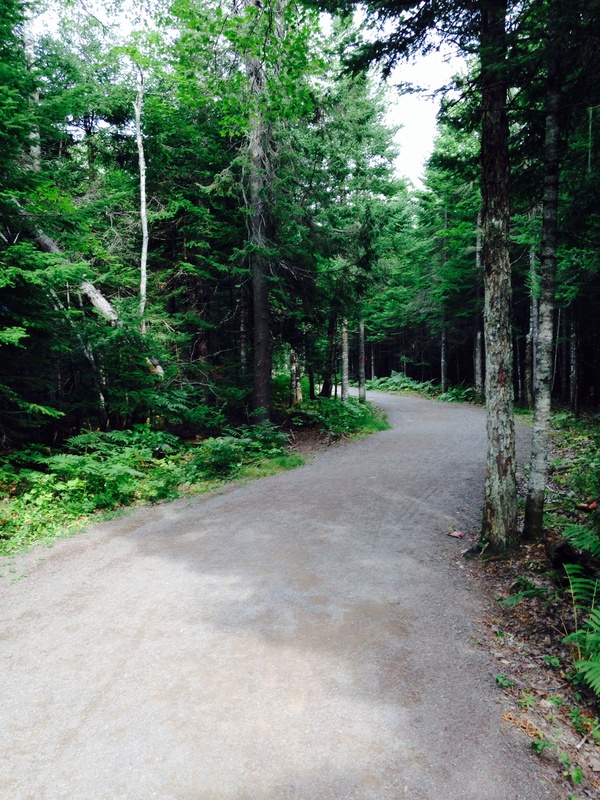 While much of the stretch has been sunny, warm and sometimes wet – the last few days have been very different. An unsettled pattern with sun, clouds, rain and repeat – often in a span of a few minutes – has been causing some New Brunswickers to utter the term fall-like given that daytime highs have been struggling to reach the low 20’s Celsius. But the long range forecast is suggesting much warmer, calmer weather will return by next week as the semi-permanent Bermuda High moves closer to the U.S. Eastern Seaboard after a period much further east in the Atlantic Ocean. Winds are carrying smoke from forest fires in British Columbia, the Prairies and the Northwest Territories into Ontario and the Northeastern United States. Forecasters say the smoke is even lowering temperatures by several degrees which has explained why Central Canada and the eastern Great Lakes region have been experiencing lower than average temperatures so far this summer. The jet stream has been carrying the smoke but officials say it is moving at such a high altitude that air quality will likely not be affected in the region. For the first time in 22 years, a hurricane is bearing down on Hawaii – and not just one but two! 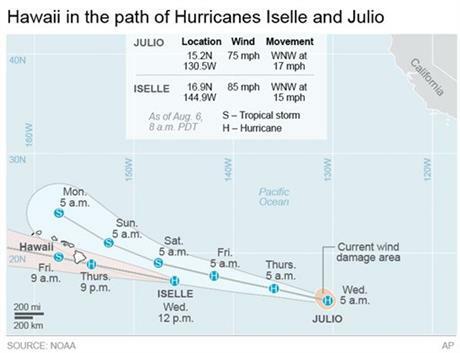 Hurricane Iselle, a Category 1 storm, is expected to slam the Big Island of Hawaii tonight with strong winds and heavy rain. Residents have been stocking up on bottled water and batteries for days now in anticipation of the one-two punch. Forecasters say Hurricane Jolio, which strengthened to a Category 2 storm today, will likely pass just north of the Pacific island chain on Sunday. The remnants of Bertha, downgraded today to a non-tropical storm system, have spared the Maritimes and are now heading for eastern Newfoundland. Forecasters say rain and gusty winds – up to 70 km/h – are likely for St. John’s and the Avalon Peninsula tomorrow. 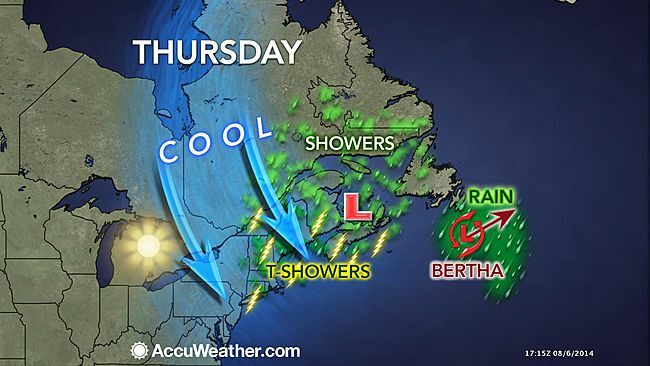 Showers, thunderstorms and cool temperatures will persist in Southeast New Brunswick tomorrow due to a low pressure system which is being held in place thanks to Bertha.